Mission Statement Sedona Recycles is dedicated to public education and to demonstrating responsible resource recovery. With full community participation, we will promote and provide opportunities to reduce, reuse, and recycle. 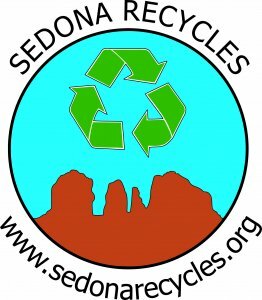 Services and Projects Sedona Recycles is a nonprofit community recycling center serving Sedona, Cottonwood, Camp Verde, Rimrock, Clarkdale, Jerome, Cornville, and the Village of Oak Creek. 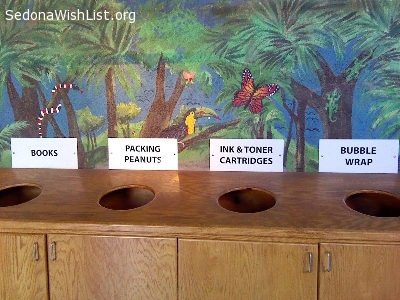 Wishes of Sedona Recycles, Inc. I teach Sustainability at three schools and have several students who speak limited English. I would love to learn some Spanish to help their transition and make learning a bit easier. If you'd like to donate Spanish lessons your time would help a child. Sedona Recycles is having its 2nd annual 90 Gifts in 90 Days fundraiser, running from October 1st to December 31st. Last year, an overwhelming 133 donations were received, exceeding the $20,000 goal. This year the goal is set at $25,000 and donations in any amount are appreciated. Donations in a friend's name make a great gift! Meet and Greeter: We are a busy facility and need a helper to answer questions, check membership with electronics drop-off, and help customers find things we offer to the public, such as bubble wrap, packing peanuts, and egg cartons. Tuesday and Thursday mornings we need someone to assist customers to dispose of their documents. **You will learn a LOT about recycling and meet some fabulous people in the process! Cleaning & Organizer: There always something to sweep up, put away, reorganize, dust, or clean, and litter to pick up off our street. ** You can learn a lot about the business side of recycling, what goes where and why. Line Sorter: Like to get in the zone? Help us sort all the mixed plastics that come to the facility. ** You will learn about the enormous variety of products on the market and what is recyclable and what isn’t. Educator Assistant: If you’re creative and have teaching skills, we can use your ideas for classroom activities. Help us design lessons and make hands-on activities. Also help with education events and outreach tables. ** Great experience in the field of education and very rewarding! Crafter: Plan recycled crafts and organize a monthly class. ** You get to keep your creations and be inspired by your students. Adopt a Business: Small businesses sometimes don't have the resources to recycle. Volunteer to pick up their materials and take them to a drop-off site. ** You can assist in a waste audit and help a business get to near zero waste! Fundraiser: If you have ideas on how to bring in funding, we need you. **Everlasting good karma. Or create your own volunteer day by combining different jobs! **What’s in it for you. Sedona Recycles is collecting USED plastic storage bins to be used as classroom recycling bins for Red Rock High School and Oak Creek School. They do not need lids and small chips or cracks are acceptable. Dimensions are roughly L:19, W:12, H:15. If you are disposing of an old storage container, please drop it off at Sedona Recycles at 2280 Shelby Dr.